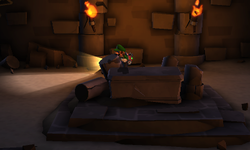 The Tomb is a room inside the Old Clockworks in Luigi's Mansion: Dark Moon. The Tomb is accessed by going to the end of the hallway of the Antechamber. The only notable object about this room is the stone tomb in the middle of the room. The Tomb is covered in sand and there are two torches on the north wall. During C-2: Underground Expedition, Luigi must travel to the Tomb because Professor E. Gadd has pinpointed that room as the location of the minute hand for the Clock Tower Gate. When Luigi inspects the Tomb, an Ancient Poltergeist appears holding the minute hand. He flees with the object and Luigi ends up having to fight three Mummies. After defeating the Mummies, the mission ends. This page was last edited on November 10, 2017, at 13:39.